This model runs in OpenCell and COR and the units are consistent throughout. It does not at present replicate the published results, most likely because there are a number of gating or switching processes described in the paper that were unable to be replicated precisely. ABSTRACT: Cardiac contraction and relaxation dynamics result from a set of simultaneously interacting Ca(2+) regulatory mechanisms. In this study, cardiocyte Ca(2+) dynamics were modeled using a set of six differential equations that were based on theories, equations, and parameters described in previous studies. Among the unique features of the model was the inclusion of bidirectional modulatory interplay between the sarcoplasmic reticular Ca(2+) release channel (SRRC) and calsequestrin (CSQ) in the SR lumen, where CSQ acted as a dynamic rather than simple Ca(2+) buffer, and acted as a Ca(2+) sensor in the SR lumen as well. The inclusion of this control mechanism was central in overcoming a number of assumptions that would otherwise have to be made about SRRC kinetics, SR Ca(2+) release rates, and SR Ca(2+) release termination when the SR lumen is assumed to act as a simple, buffered Ca(2+) sink. The model was sufficient to reproduce a graded Ca(2+)-induced Ca(2+) release (CICR) response, CICR with high gain, and a system with reasonable stability. As constructed, the model successfully replicated the results of several previously published experiments that dealt with the Ca(2+) dependence of the SRRC (, J. Gen. Physiol. 85:247-289), the refractoriness of the SRRC (, Am. J. Physiol. 270:C148-C159), the SR Ca(2+) load dependence of SR Ca(2+) release (, Am. J. Physiol. 268:C1313-C1329;, J. Biol. Chem. 267:20850-20856), SR Ca(2+) leak (, J. Physiol. (Lond.). 474:463-471;, Biophys. J. 68:2015-2022), SR Ca(2+) load regulation by leak and uptake (, J. Gen. Physiol. 111:491-504), the effect of Ca(2+) trigger duration on SR Ca(2+) release (, Am. J. Physiol. 258:C944-C954), the apparent relationship that exists between sarcoplasmic and sarcoplasmic reticular calcium concentrations (, Biophys. J. 73:1524-1531), and a variety of contraction frequency-dependent alterations in sarcoplasmic [Ca(2+)] dynamics that are normally observed in the laboratory, including rest potentiation, a negative frequency-[Ca(2+)] relationship, and extrasystolic potentiation. Furthermore, under the condition of a simulated Ca(2+) overload, an alternans-like state was produced. In summary, the current model of cardiocyte Ca(2+) dynamics provides an integrated theoretical framework of fundamental cellular Ca(2+) regulatory processes that is sufficient to predict a broad array of observable experimental outcomes. 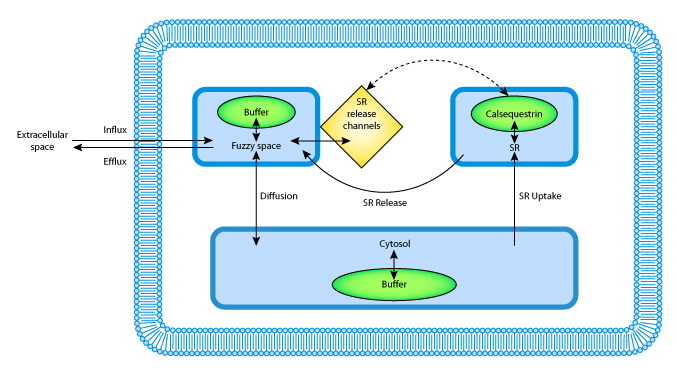 Cell schematic for the model representing three intracellular compartments with buffering, the extracellular space, and the related Ca2+ movement processes. Derived from workspace Snyder, Palmer, Moore, 2000 at changeset 375fae3a770d.